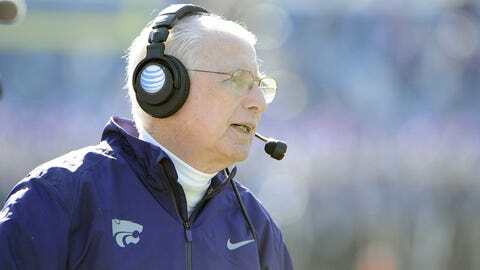 Bill Snyder has a boatload of talent set to return to Kansas State next season. KANSAS CITY, Mo. — It’s funny. And futile. But mostly funny. We keep asking Bill Snyder when he’s going to hang up the whistle again, after birthday 72 becomes birthday 73 and birthday 73 becomes birthday 74, and we — we being the scribes, the hacks, the huddled masses yearning to eat for free — are the absolute last people on the planet he’s going to tell. After all, his name is on the building out front and the highway out back. Bill’s house. Bill’s rules. He’ll be 75 next October, this Jedi Master with the purple windbreaker and the 16 goals etched on tablets of stone and tablets of Apple. He’ll also have, returning, 100 percent of Kansas State’s passing yards and passing touchdowns from the year before. And 70.7 percent of the receiving yards. And 60.7 percent of the rushing scores. And 68.4 percent of the receiving scores. And 50.5 percent of the rushing yards. And, on paper, a schedule that seems user-friendly, too, save for a visit from Auburn in September, an October 18 trip to Oklahoma and a December 6 junket to Baylor. And Ryan Mueller. And Tyler Lockett. And two guys who’ve logged serious miles, at home and on the road, under center. You want more juice? During the first four years of The Snyder Era, Part II, the Wildcats went 16-5 in games decided by eight points or fewer. This past fall, K-State was 1-2. History says they’re due. Canasta can wait. Oh, the secondary will need some patchwork; so will the linebacking corps and the offensive line. But unlike a year ago, regardless of what happens late Saturday night against Michigan (7-5) at the Buffalo Wild Wings Bowl, the post-January trend line at K-State (7-5) is pointing upward. And, heck, given the benefit of hindsight, this campaign might well be remembered, in the long view, as one of the sneaky-good ones on Snyder’s storied resume. With the exception of wide receiver, tailback and offensive line, the 2013 Wildcats were one giant reset button. K-State came out of the summer with the third-lowest percentage of returning lettermen in the Big 12 (60.9 percent), the second-lowest percentage of offensive yards returning (35.7), and the lowest percentage of tackles returning (34.2). The slate was more or less wiped clean along the defensive line, at linebacker, and quarterback, where Collin Klein had left King-Kong-sized cleats to try and replace. "You have heard me say that so many times that I really am a strong believer that to get the pie in the sky, whatever that goal may be, then all the things that allow me to climb the stairs to get there are not on my mind," Snyder said earlier this month. "That was the hardest part, getting them to reinvest in what those goals and intrinsic values were that would allow us to get there. "It was not about readjusting what their ultimate goals were. It was more on getting them invested in what our goals were and the stair-step process; what needed to take place in order to have a chance to obtain what they wanted to obtain." At least two things happened from mid-October onward: One, a front-loaded schedule (Texas, Oklahoma State, Baylor) eased the strain down the stretch; the ‘Cats got handed their toughest league tests right out of the chute. Two, a young defense started to gel, especially along the defensive line, where junior end Mueller blossomed into a heat-seeking, quarterback-mashing star, placing second in the Big 12 in sacks. The brightest lights to come out of 2013 are juniors. Mueller is back, health-permitting. So are Daniel Sams (Mr. Legs) and Jake Waters (Mr. Arms), assuming both can be kept happy. Ditto Lockett, arguably the best receiver/return man on the circuit. The Wildcats might have the best combo under center besides Baylor, depending on what Snyder ultimately decides to do with Sams, a sophomore too gifted, too elusive, to spend his Saturday afternoons giving hand signals or holding clipboards. Sams has even indicated — at least to the Topeka (Kan.) Capital-Journal — that he would entertain a change of position, if it meant seeing more of the field and less of the back of his coach’s head. Snyder, true to form, is keeping his blueprints clutched tighter to his chest. But we know this much: He’s got a rolling five-year contract. And all the tools are there. "This next bowl game is going to lead to another opportunity," Mueller told reporters recently. "Hopefully, after the game, we can celebrate." Given a few breaks, they just might dominate, too. With this roster, 75 is the new 60.